Home » Isla Fisher Visits The Market With Her Trio! Multi-tasking mama! Isla Fisher was photographed at the market on Sunday with her three kids Olive Baron Cohen, Elula Lottie Miriam Cohen, and Montgomery Moses Brian Baron Cohen. With no nanny in sight, the actress strapped Montgomery to her back in an ErgoBaby carrier as she strolled through the fair portion of the market with a coffee in hand. 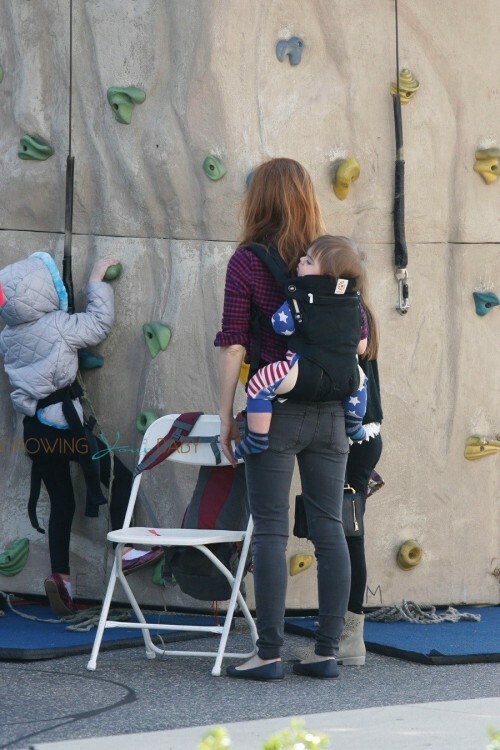 The doting mama also stayed close as her youngest daughter Elula tackled the rock climbing wall. But what was even more awesome was that she arrived in a minivan! Isla currently stars in her husband’s new comic movie The Brothers Grimsby and her film Nocturnal Animals will be released later this year.